Home Sports Bringin’ XC Back! 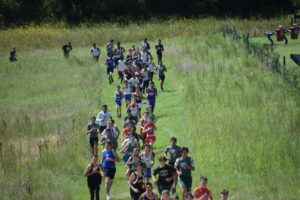 ELKHART – Over 20 schools made the Wednesday afternoon trek to compete in the Elkhart Cross Country Meet held at Elkhart High School. With a slight breeze and cooler than normal temperatures, the conditions were perfect as the runners toed the starting line for the 1:00 p.m. start time. The varsity girls were the first group of runners on the course. Over 100 athletes were in competition and eight schools from Anderson and Houston County were represented when the starter’s pistol was fired. 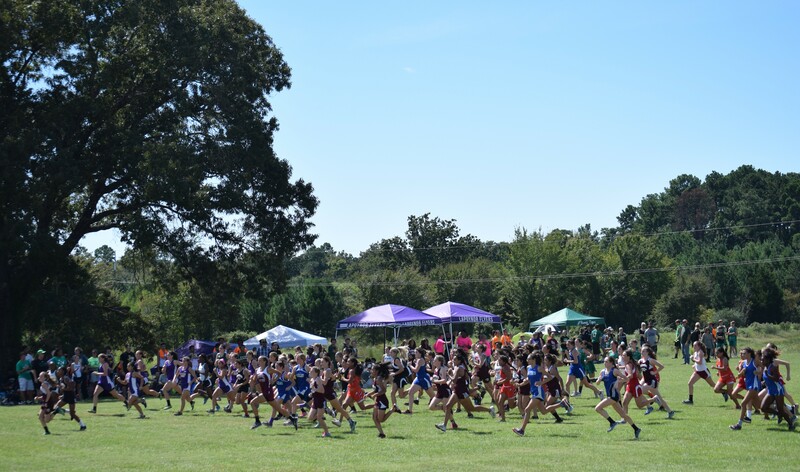 At the team level: the Palestine Lady Cats finished in first place; the El khart Lady Elks finished second; the Teague Lady Lions were third; the Rusk Lady Eagles were fourth; the Slocum Lady Mustangs were fifth and the Latexo Lady Tigers finished sixth. Individuals for each area team are listed with how they placed and their time. For the Cayuga Lady Wildcats: 51) Emily Banta – 16.02; 58) Watson – 16.19; 81) Brenda Rivers- 17.36; 82) Morgan Turner – 17 .4; 92) Stormi Land 19.10; 94) Tori Williams – 19.12; and 95) Stacie Holt – 19.12.8. For the Crockett Lady Bulldogs, Alexis Arias finished in place 72 with a time of 17.06. For the Elkhart Lady Elks: 5) Madison Crader – 13.57; 11) Monique Ashford – 14.32; 12) Kathryn Esparza – 14.36 13) Melanie Barnett – 14.4; 44) Megan Bailey – 15.47; and 50) Annalisa Trevino – 15.57.9. For the Latexo Lady Tigers: 17) Maddie Kelsey – 14.48; 31) Destiny Pettitt – 15.24; 39) Taylor Upshaw- 15.43; 49) Alexa Knight – 15.57; 53) Cinderella Rice -16.05; and 62) Gracie Gibbins – 16.33. For the Lovelady Lady Lions: 14) Madalyn James -14.43; 33) Hannah Yolk – 15.27; 35) Jala Rollo – 15.33; and 46) Olivia Wilson – 15.54. For the Palestine LadyCats: 4) Olivia Cone – 13.48; 9) Amber Taylor – 14.2; 14) Ashley Davis – 14.49; 21) Noelia Hernandez – 14.56; 28) Yari Garcia – 15.15; 29) Mayra Gonzales – 15.19; 36) Macey Everhart – 15.35; and 38) Heidi Rodriguez – 15.37. For the Slocum Lady Mustangs: 7) Christy Dunham – 14.13; 8) Courtney January -14.15; 37) Jalyn Fletcher – 15.36; 61) Laney Lasiter – 16.26; 64) Caroline Gray – 16.35.8; 67) Shelby Bowman – 16.48; and 76) Tiffany Jackson – 17.17. For the Westwo od Lady Panthers: 22) Karsyn Lafitte – 14.59; 54) Katy Espinosa – 16.05.9; 56) Jordyn Cobbie – 16.08; 75) Jas Mitchell – 17.13; 79) Leslie Orneales – 17.3; 80) Faaria Tinnion – 17.34; 85) Madelyn Colley – 17.48; and 87) Leslie Vigil – 18.06. 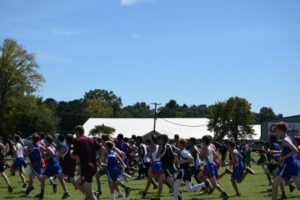 The varsity boys started shortly after the girls finished running and had over 120 competitors waiting for the start of their race. 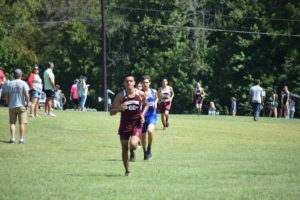 At the team level: the Palestine Wildcats finished in first place; the Latexo Tigers finished second; Elkhart Elks were third; the Slocum Mustangs were fourth; the Teague Lions were fifth and the La Poyner Flyers finished sixth. For the Cayuga Wildcats: 15) Adrian Mickens -20.18; 53) Gevon Williams – 22.46; 54) Shelton Trahan- 22.48; 64) Colby Seale – 23.06; 67) Richard Hazelwood – 23.11; 78) Conner Daniel – 24.19; and 118) Garrett Beckman – 28.52. For the Crockett Bulldogs: 75) Flavio Sanchez – 23.59; 79) Jack Meadows – 24.39; and 117) Thomas Hawkins – 28.41. For the Elkhart Elks: 9) William Harris – 19.28; 16) Zach Fogle – 20.3; 23) Brady Johnson – 20.48; 35) Mayraj Khan – 22.01; 50) Josh Lawson – 22.4; 62) Colton Willis – 23.01; 66) Hjo Higginbotham – 23.10.9; and 71) Colton Parker – 23.33. For the Frankston Indians, Dalton Jones ran a time of 24.56and finished at number 85. For the Latexo Tigers: 6) Carter Catoe – 19.08; 8) Tristan Curless – 19.25; 11) Conner McKinnon – 19.56; 33) Kase Miller – 21.55; 58) Sonny Townsend – 22.53; 63) Randell Holcomb – 23.04; 89) Dolan Mullins- 25.07; and 90) Carson Hardy – 25.27. For the Lovelady Lions, Jacolian Hawkins ran a time of 24.48and finished at number 82. For the Palestine Wildcats: 1) Manny Romero – 18.41; 2) Michael Guzman – 18.45; 7) Grant At taway- 19.09; 10) Daniel Sanchez – 19.35; 14) Cristian Guzman – 20.15; 18) Frank Durugbor – 20.37; and 27) Taylor Rosson – 21.03. For the Slocum Mustangs: 3) Travis Neal – 18.46; 34) Jordan Randall – 21.58; 42) Randy Guess – 22.22; 45) Trevor Stewart – 22.27.7; 59) Gage Horn – 22.54; 96) Jonathon Watson – 25.48; and 113) Chase Lomax – 27.44. For the Westwood Tigers: 19) Tommy Umanzor – 20.41; 22) Brando Castillo – 20.47; 83) Nolan Kelly- 24.54; 84) Carlos Hernandez – 24.55; 100) Derilyn Johnson – 26.32; 101) Xavier Billups – 26.33; 103) Rodrick Cook – 26.35; 104) Bevin Gomez – 26.42; 106) Javarus Summons – 26.5; 110) Martin Suarez – 27.04; and 112) Quentun Dean – 27.23. At the team level for the JV boys, the Palestine Wildcats finished first, the Elkhart Elks finished second and the Westwood panthers finished third. At the team level for the JV girls, the Palestine LadyCats finished first and the Slocum Lady Mustangs finished second.